I don’t know about you, but winter sometimes drags me down into the dumps. I’ll have days where all I want to do is sleep in until noon and then binge watch the latest Netflix show well into the night, ordering takeout so I don’t even have to leave home. Or I’ll have other days where I stare at a blank computer screen for what feels like hours, willing creative content to pour out of me when it seems like every inspired bone in my body has been sucked dry. Those days are tough, the times they come around, but there are definitely ways to avoid those feelings and stay inspired. Even though life can get monotonous, I’ve compiled a few of the things that I like to do to get my creative juices flowing and stay inspired longer. 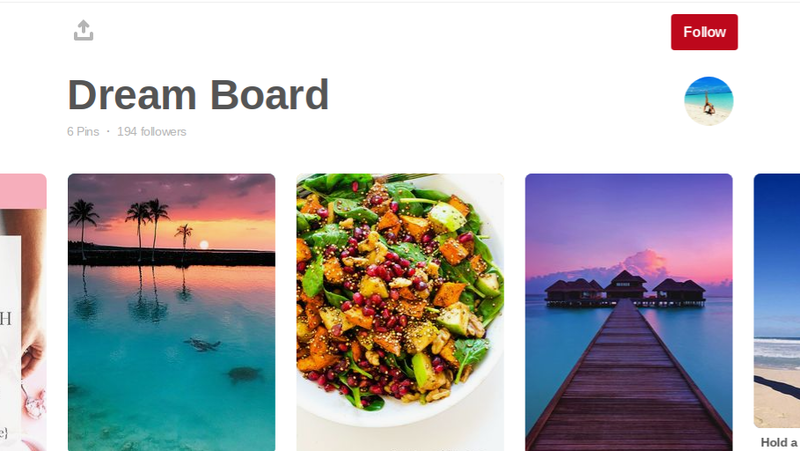 Here's a little snippet of my dream board, click on the image to see the full board on Pinterest! An excellent way to keep moving forward is to put a point in front of you that you have to reach. Sometimes that means making a dream board from cut out magazines to hang on your wall and remind you of everything that you’re hoping to achieve, and sometimes it means making a simple list. When I was 18 I made a dream board of all the things I wanted to do in life (think a bucket list but made of cut out pictures of old National Geographics and printouts of yoga poses). By 21 I had completed them all except for diving with sharks; some things that I found scary and unreachable, like the lotus handstand, have become some of my favorite things and poses to do! Even if you aren’t a crafty person, there are always apps like Pinterest that you can make digital dream boards or apps to set goals on. Some days, like I said before, can feel as though you are incapable of producing anything worthwhile. While that feeling stinks, it’s helpful to look back at everything you’ve done. Can you maybe not make that one recipe today, or write a story, or do a yoga pose that you’ve been attempting for so long? It’s okay, because you’ve done plenty of incredible things before, and one off day isn’t going to change that. Even days with no progress are still one day closer to reaching your goal, and it helps to look back at how far you’ve come already! Travel. Go new places. Get out of your comfort zone and explore, meet new people, interact with new cultures. Often times what’s stopping you is that you’re surrounded by the same old people with the same old ideas, and while they work the monotony of it all isn’t working for you. Even if it’s in your city, go to a new restaurant or a place a little further from home than you would normally go, take your laptop or work stuff, and just let others inspire you. Often times just talking to the woman sitting next to you on the bus can give you a new outlook on life, and a renewed sense of inspiration. Regardless of the technique, there are many ways to continue to be inspired for life. I’ve listed just a few of them, but if you have any specific things that work for you leave them in the comments below! I’d love to hear from you.